It was the bold clashing patterns, bright colours and mod fashions of the 1960’s that stole Adele La Belle’s heart. And this isn’t surprising as you find out more about this pint sized pinup. The whole vibe of the 1960’s, fun loving, care free, fun and fashionable fit Adele La Belle’s personality! And as she discovered more about the 60’s doors to the 1950’s, 1940’s all opened up and asked to be explored. That’s how she found pinup. But it was more her love of performing that pushed her to start competing rather than a love of vintage. Adele La Belle was looking for as many places as she could to spin her Hula Hoops. She learnt the art of hooping at the National Institute of Circus Arts and her journey there was an interesting one. It started as a talented gymnast when she was a child. Before transferring her skills from the gym floor to the trampoline. And it was an Olympic coach, Melic Tichabaev, who encouraged her to give circus a go. So when the auditions came to her home state of Perth, she gave it a go and then found herself moving to Melbourne for a four year degree. And along the way the love of vintage seemed to follow her circus decisions. The Hula Hoop may have been around for years, but the plastic version we know today was created in the late 1950’s. In the middle of 1958 the plastic hoop was marketed and by 1960 more than 100 million hula hoops were being sold around the world each and every year. For Adele La Belle the reason for specialising in Hula Hoops came down to being something she could do without relying on a troupe of circus performers to launch her out of a cannon or through her around a big top. And when she started embracing pinup and the psychobilly side of the scene, she found Hula Hoops were a great choice for talent at contests. In 2016 she was crowned Psychobilly Queen performing as a rather scary clown! And now she judges and mentors others competing in pinup competitions of all kinds. It was so great to be able to sit down with Adele La Belle and talk about everything from being a young athlete to the best way to stop a hula hoop hitting your ankles! 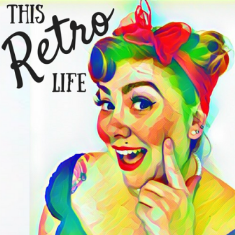 Listen to our chat with Adele La Belle in episode 26 of This Retro Life.